Fortunately, Darius has some nifty new tools with which to save the Martian people. The core of Red Faction is, as always, the idea that every man-made structure in the game can be destroyed. This doesn't change just because you're underground, either - in fact, it actually opens up some interesting new possibilities. "Now that it's underground you can do things like put destructible objects on the wall and ceiling," said Boone, which works well in conjunction with the new guns and gadgets at Darius' disposal. The singularity cannon creates a miniature black hole which can be used to position enemies and objects where you want them, and the plasma beam disintegrates anything it touches, acting like the proverbial hot knife through butter (only the butter is a building). But they pale in comparison to the entertainment of the magnet gun. I acquired the magnet gun fairly early in the demo, and it quickly became a contender for "coolest new weapon of 2011." In essence, it's an inverted version of the iconic Portal gun: You shoot an object to "tag" it, then shoot a second object - and whatever you shot first gets flung at whatever you shot second. You can use this to throw structures at enemies (I ripped a pipe off the wall and used it to crush some cultist soldiers), you can use this to throw enemies at structures (or off bridges), and you can use it to throw enemies at other enemies, which is particularly enjoyable. Another interesting tool is the Nanoforge, which is an odd little device: Red Faction may be all about destruction, but the Nanoforge lets you instantly rebuild anything and everything that you can destroy. This can be simply used in the most cathartic sense of rebuilding what you just destroyed for fun - so you can destroy it again. It can be used in a scripted progression sense, of "Hey Darius, rebuild this bridge so you can go over there and do that thing we need you to do." In at least one memorable moment from the demo, it was used as a tool in a boss fight: While hunting down the cultist leader, I ran into an enemy power armor that would fire a powerful (though extremely telegraphed) cannon blast at Darius, destroying whatever objects he happened to be using as cover. The solution? Rebuild your own cover as necessary, using it to stay out of the machine's sight, and its line of fire. The sledgehammer from Guerrilla also makes a return to allow you to smash man-made structures (or enemies) into itty bitty bits. Frankly, all the neat weaponry and tools of destruction made the regular shooting sequences - when you didn't have something like the magnet gun - all the more run-of-the-mill. I can shoot evil cultists and buglike aliens with shotguns and assault rifles in two dozen games currently on the market, Volition. Why would I want to do that when I can re-enact Phantom of the Opera and drop a light fixture on their heads? Or sledgehammer an electrical tower down around them? 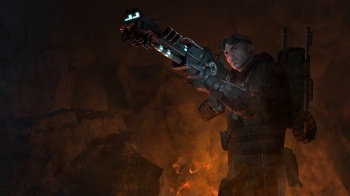 While the demo had some occasionally memorable scripted moments (and thankfully, none of the irritating "allied" NPCs from Guerrilla), the real appeal of Red Faction remains what it has always been: Blowing stuff up and messing around with fun gadgets and weaponry is a good time, and the more of that the game has, the better. Red Faction: Armageddon is due out on May 17th, 2011.